Chinese name: 莫高窟 (Mogao Ku). Location: 25 km southeast of Dunhuang City, Gansu Province. - November to March: CNY120 (sale of tickets stops at 16:00). - November to April : 09:15-17:30. How to get there: Buses running between downtown Dunhuang and Mogao Grottoes depart every half an hour from 08:30 to approximately 19:00 every day. It takes approximately an hour for a one-way trip. 2. 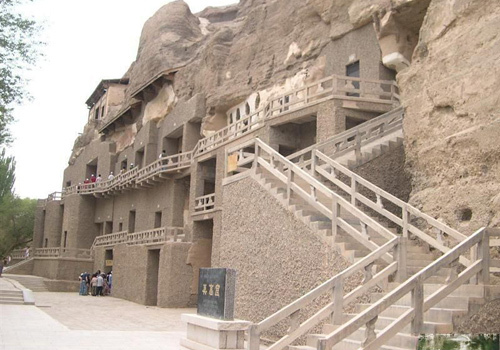 Only 8-10 caves are opened to visitors, who will be guided by professional commentators when visiting Mogao Grottoes; it is required to apply and pay extra fee for visiting some special caves. 3. 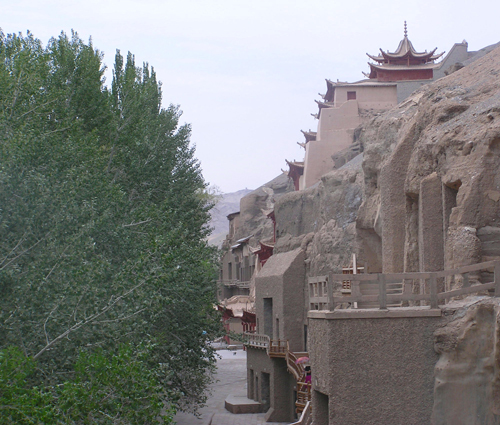 Humidity controllers are set up in every cave of Mogao Grottoes. When humility inside some cave is influenced by visitors' breath, the controller inside it will alarm and the cave will be closed temporarily. 4. A new museum attached to Mogao Grottoes has been opened to visitors, who can visit copies of the murals of Mogao Grottoes inside the simulated caves of the museum. As an important strategic location on the Silk Road in the ancient times, the place Mogao Grottoes locates was not only a transfer station of east-west trade but also an intersection where oriental and western religions, cultures and knowledge met. 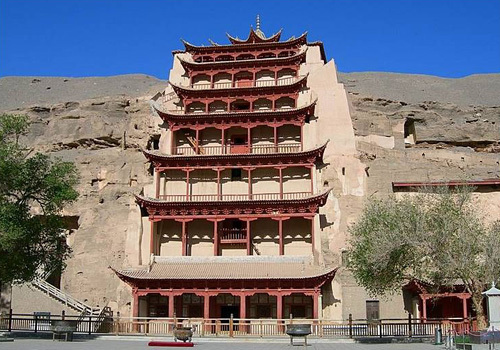 Constructed on the bluff at the eastern foot of Mount Mingsha, Mogao Grottoes or Western Thousand Buddhas Caves, is among the Four Greatest Grottoes of China as well as the largest and most well-preserved treasure house of Buddhist culture and arts in the world. 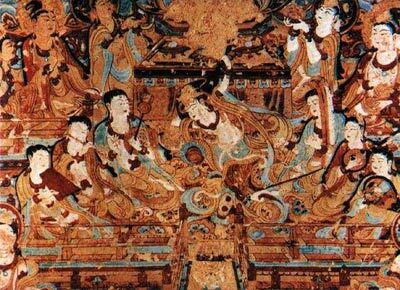 Hailed as the most valuable cultural discovery in the 20th century, Mogao Grottoes gets great fame all over the world for exquisite murals and sculptures. The construction started from year 366 during the Sixteen Kingdoms Period (304-439) and lasted in following dynasties for almost one thousand and five hundred years, which make Mogao Grottoes a sacred land of Buddhism finnaly. Stretching foe over 1600 meters from south to north, Mogao Grottoes still keep 735 caves well-preserved with 4.5 square meters murals, 2415 colored clay statues and more than 50,000 historical relic, from all of which a new study – Dunhaung Studies – derived. Due to its brilliance in ancient culture, Mogao Grottoes was added to the World Cultural Heritage list by the UNESCO in 1987. 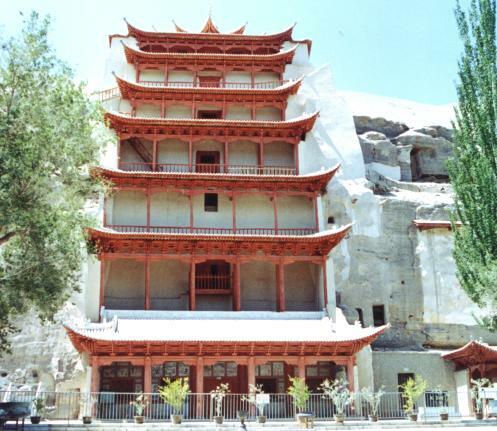 The existing 735 caves of Mogao Grottoes can be divided into the southern area (with 487 caves) where monks held Buddhist activities and the northern area (with 248 caves) which was mainly used as a place where monks cultivated and lived as well the graveyard where monks were buried after their death. According to statistics, 492 of the 735 caves are home to existing murals and sculptures. Being the largest, longest and richest art gallery of Buddhism in the world, all of murals of Mogao Grottoes can stretch for over 30 km if arranged in a line. 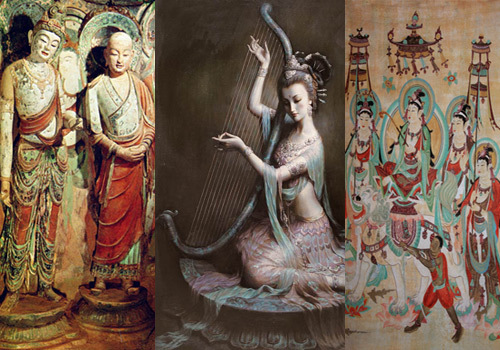 The themes of the murals are various, ranking from Buddhas, flying Apsaras, fairy maidens to stories about Buddhist sutras, with exquisite vignettes. Among the over 2000 colored statues of Buddhas in Mogao Grottoes, there is one sitting Buddha reaching as high as 33 meters as well as one is less than 20 centimeters in height. 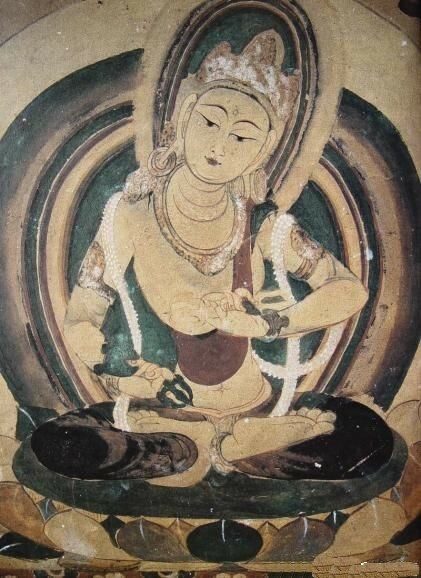 In addition, a great number of ancient Buddhist sutras, writs, scroll paintings, and so on, have also been found in a closed stone room in Mogao Grottoes.